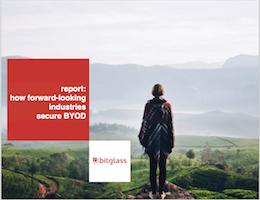 In a survey of over 800 cybersecurity professionals, IT leaders across five major industries—financial services, tech, healthcare, government, and education—reveal how their organizations approach BYOD. Learn about top security concerns, the relative importance of key risk control measures, and why adoption is accelerating in some sectors. Rob Smith, John Girard, and Dionisio Zumerle, “How to Live With Unmanaged Devices,” August 2015.